PHILADELPHIA, Oct. 11, 2018 /PRNewswire/ -- HealthVerity took home the title of 2018 Best Tech Startup from the Third Annual Philadelphia Timmy Awards ceremony after Tech in Motion announced the winners live in front of 300 tech enthusiasts, executives and entrepreneurs. After deliberation by a panel of expert judges and community voting, HealthVerity joined the ranks of innovators such as Venmo and ShopRunner that have claimed a Timmy Award in prior years. "As the number of startups increases in the Philadelphia region, sodoes the innovation happening in the city. HealthVerity is making Philadelphia more alluring as a place to work in tech," said Mandy Walker, Director of Marketing at Tech in Motion. "The Timmy Awards were created o elevate local leaders like HealthVerity that make an impact from the beginning." 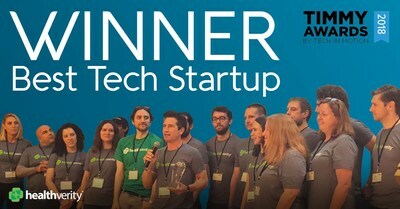 "Receiving the award for Best Tech Startup in Philadelphia really speaks to the hard work, determination and ground-breaking technology our team has developed," said Andrew Goldberg, COO and Co-founder of HealthVerity. We're based in Center City and many on our team are graduates from local universities; it's a priority for us to remain true to our roots and contribute to the rising tech scene in Philadelphia. At HealthVerity, we're on a mission to change the way organizations in healthcare are making life-changing decisions and we're happy to do that from the city of brotherly love." HealthVerity has been on a roll as of late having been named to the list of"10 Best Big Data Companies 2018" earlier this month by CIO Bulletin. HealthVerity is transforming the way data-led organizations are making life-changing decisions. Our technology platform serves as the foundation for the rapid creation, exchange and management of healthcare and consumer data in a fully-interoperable, privacy-protecting manner. Advantaged by highly sophisticated identity resolution and matching solutions, HealthVerity is on a mission to increase transparency and activate deeper insights across the healthcare industry. Learn more at http://www.healthverity.com.